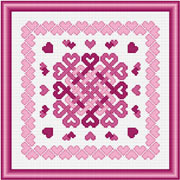 This cross-stitch Celtic design is surrounded by hearts, hearts, and more hearts, including a heart border. Stitched in soft plum and pink shades, it is the perfect image of your love, displaying how woven together it is even while sending it outward and sharing it. All whole stitches are used. With Supplies: $23.48 You download the design. We will send you, 6 skeins of DMC Floss & Wichlet 28ct. 18x27" Jobelan (White) to complete your project.